$1k? Damn, what are they smoking? $800 fine, $600 for a freesync version fine. But $1k? I've been looking forward to the 240hz 1440p monitors but i really dont want TN anymore. I want one of LGs newer Nano IPS 1ms IPS monitors at 1440p 240hz. I'll settle for current 1ms TN speeds with IPS and let TN move on to faster 0.5ms. The prices of these monitors really makes me appreciate how i got my C7 last year for $1200 brand new lol. I think the whole "0.5ms" thing is necessary in order to ensure that all transitions are below 4ms for 240Hz operation. The new LG IPS may not be under 4ms overall despite being marketed as 1ms. This. Many of us play with tilted keyboards and that protrusion with make it impossible have nice keyboard placement. But if it got VESA this doesnt matter. I think the 1ms marketing is because of strobing. Technically, it's correct. Ideally, the vast majority of transitions will happen during a backlight off phase. Yes, monitor manufacturers are now using their strobe numbers as the "pixel speed". 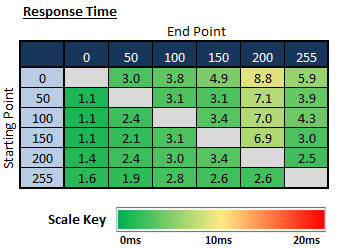 IPS isn't going to be anywhere near as fast as TN, especially these new 0.5ms TN panels. Wouldn't they advertise it as "MPRT" if it's strobing response time? Usually I see "GtG" for non strobed response time advertisement and "MPRT" for strobing. If that new LG 240Hz IPS is marketed as 1ms MPRT then I have even further doubts that it will be well suited for 240Hz. Wish they would make a 24.5" version without the harmon kardon speakers and use freesync instead. I think a lot of that $1k price tag is from G-Sync and having a 'premium' audio name like harmon kardon for the speakers. Going to be interesting to see the prices from competitors if they've gotten their hands on the same panel. I can't justify spending $1k on a TN panel, unless it was absolutely perfect from lottery bs every monitor seems to have. These new 0.5ms were rumored to be better, but seems like it was all BS. I read on blurbusters about improved viewing angles, better colors, etc - but the MSI 0.5ms released and everyone said it looks like the typical last gen TN with no improvements. And they advertise 0.5ms, but if you go on the MSI site, the spec sheet is listed as 1ms. Same exact thing with the new Acer, advertised as 0.5ms, but spec page listed as 1ms. If you check the LG spec sheet, it's listed as 0.5ms with 'extreme' OD. So it's likely not going to be practical to use extreme 0.5ms, unless 'extreme' is just marketing bs to imply it's very good. Every 'extreme' od setting I've tried on every monitor was always the worst with trailing, overshoot, and other issues you typically get with the fastest overclocked overdrives. Last edited by gene-z; 01-13-2019 at 10:27 PM. Msi and Acer have 1440p 240Hz monitors as well? If they do I'm interested one as a step up from my Asus XG248Q 240Hz panel. Would definitely ditch the speakers in order to lower the price. Nope, they're both 1080/24.5", "0.5ms"
This was advertised as 0.5ms all the way up until launch, then magically 0.5ms marketing vanished when it launched. This should maybe give you a headsup that 0.5ms isn't there yet, and maybe Lenovo includes it as an 'extreme' profile. Who knows, we will have to wait and see, as response times have a long history with false advertisement. 0.5ms over all the advertising, if you scroll down to spec sheet, it's listed as '1 ms（GTG)'. Last edited by gene-z; 01-13-2019 at 10:47 PM.